Have you ever examined street signs in Dublin? I mean those ordinary common-or-garden signs that adorn our gables and walls and serve to tell us where we are – that is if they’re not covered with roving greenery or placed so high up that you get a crick in your neck trying to read them. Those ones. I hadn’t considered them much, either. Apart from their function, that is, of providing information. But that’s all changed. The reason I’m not only noticing, but examining, street signs – and taking photos of them on my phone – is related to the publication of my forthcoming collection of stories, Prosperity Drive (Jonathan Cape, January 2016). The eponymous fictional street in Dublin is the triggering location of and the uniting thread running through the stories. When I went looking for an image of the archetypal Dublin street sign, I was faced with a plethora of the current style of sign – white type on a blue background, sometimes with the district number in the right hand corner in reverse – blue on white. (Though with our new super-duper ZIP codes, these old single digits will soon begin to look a bit forlorn.) But what I was looking for was its predecessors. These were tin, with a garden green background, white lettering and the Irish version of the street name in the old Cló Gaelach. Blame it on nostalgia, but when I was growing up Dublin in the Sixties, these were the standard signs and they remain fixed in my memory as the original and the best. I didn’t hold out much hope of finding any left – rust and vandalism had surely put paid to them, I thought. But I was pleasantly surprised at how many of them still survive, and I didn’t have to travel very far from my Blackrock base to find them. 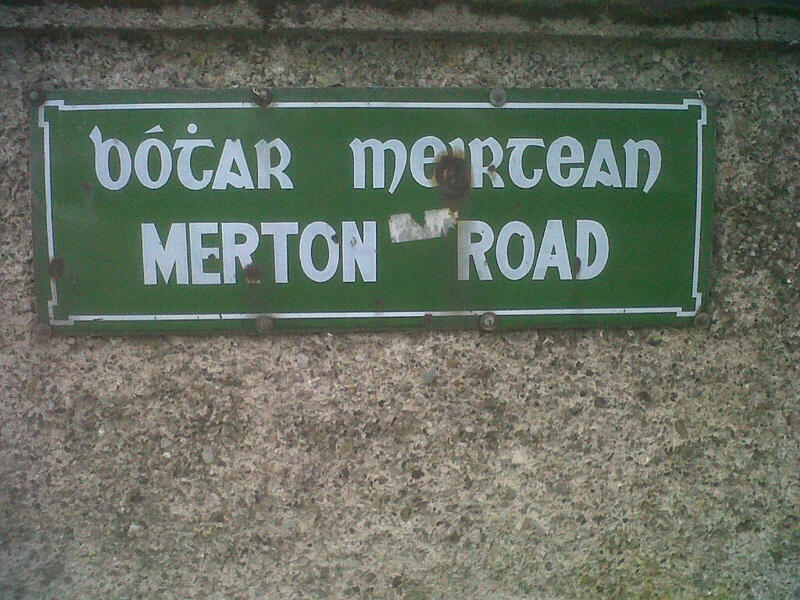 My other surprise was to find a huge variation in fonts, style and colours in Dublin street signs. (As an ex sub-editor, fonts, in particular, are a bit of a passion.) 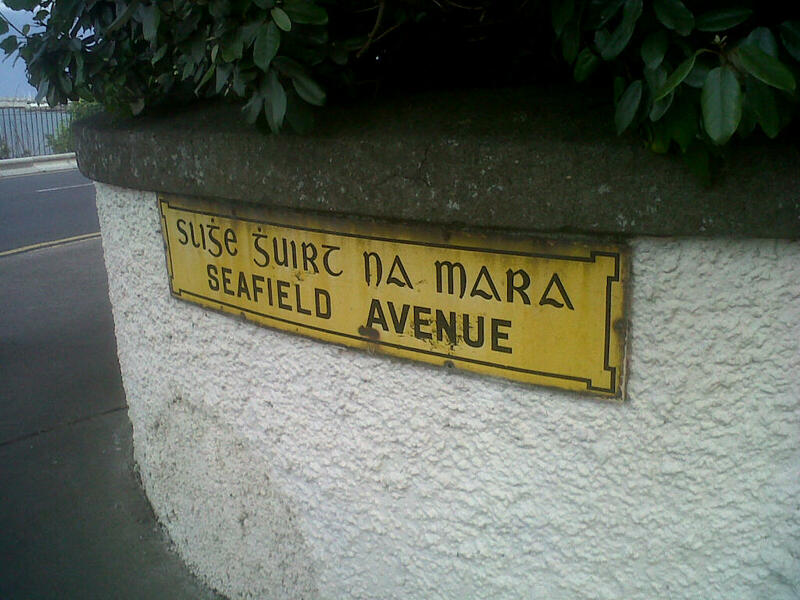 As well as the blue and white design, there are also black on yellow signs – particularly in Dún Laoghaire and Monkstown. Perhaps in the early days, each city borough had its own style of sign? I also found a great deal of competing signage. 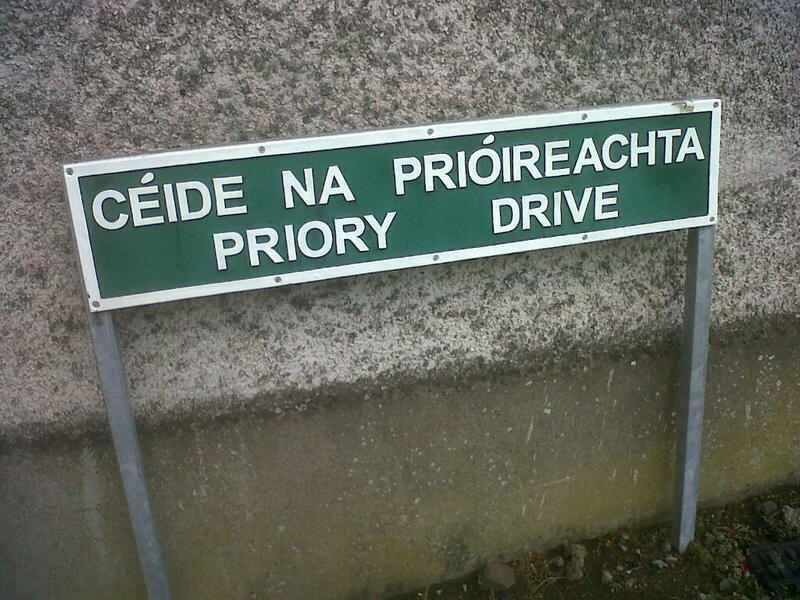 Sometimes – as with Priory Drive in Stillorgan (see below) – there were not only two different styles of signs, but a different Irish translation of the English street name – one at either end of the street. In later signs – probably from the 1970s onwards, the Cló Gaelach was dispensed with, and the Irish was rendered in Roman script. Then the district numbers were added. As you can see, I’ve now become a bit of an anorak about street signage. Who cares where I’m going, I’m more interested in what the sign looks like. I thought I’d hunted down every last variation, but it was only when looking at the collection of images on my phone, I noticed that not even the vintage green signs are consistent. On some, there is a lovely white trim around the edges, which I think looks very classy. So classy I was tempted to indulge in a bit of vandalism myself and lever one of these beauties from its moorings. But I desisted. I’ll stick with my memories and the pantheon of place-names on my phone.